LAS VEGAS - Manny Pacquiao won a unanimous decision in his rematch with Timothy Bradley on Saturday, avenging his 2012 loss and claiming the WBO welterweight title. Pacquiao (56-5-2) pursued and peppered the previously unbeaten Bradley around the MGM Grand Garden ring with an aggressive performance recalling the Pacman in his prime. Bradley fought back with counterpunching and elusiveness, but Pacquiao kept up his attack while Bradley (31-1) struggled in the closing rounds. Pacquiao left little doubt about the result of the rematch in the same arena where they met nearly two years ago. Bradley's split-decision victory astonished most ringside observers, who felt Pacquiao had earned a clear decision. "I knew I had to do more in this fight than I did in the last fight," Pacquiao said. "I tried, I really tried," Bradley said. "I wanted that knockout. Manny is a great fighter, one of the best in the world. I lost to one of the greatest fighters in boxing. I kept trying to throw something over the top. That's what we worked on in camp. That was the plan, but Pacquiao has great footwork." Pacquiao landed 35 percent of his 563 punches, while Bradley connected with just 22 percent of his 627 blows. Pacquiao's jab was much more effective, landing 23 percent to Bradley's measly 11 percent, and the Pacman had a slight edge in landing 148 power punches to Bradley's 109. Pacquiao's performance righted one of the biggest perceived wrongs in recent boxing history. Pacquiao was an eight-division world champion on 15-fight winning streak when Bradley was awarded a split decision in their last bout. Pacquiao was more aggressive and accurate from the opening minutes of the rematch, sticking to trainer Freddie Roach's pleas to take the action to Bradley. They exchanged big shots in the opening rounds, but Pacquiao appeared to wear out Bradley with the heavy early pace - and the Pacman never slowed down. "I didn't want to get careless," Pacquiao said. "I picked up more steam in the second half when I made adjustments that Freddie gave me in the corner. Bradley was much better than in the first fight we had. He hurt me on the chin." Pacquiao landed a series of big left hands in the early rounds, knocking back Bradley with gusto. 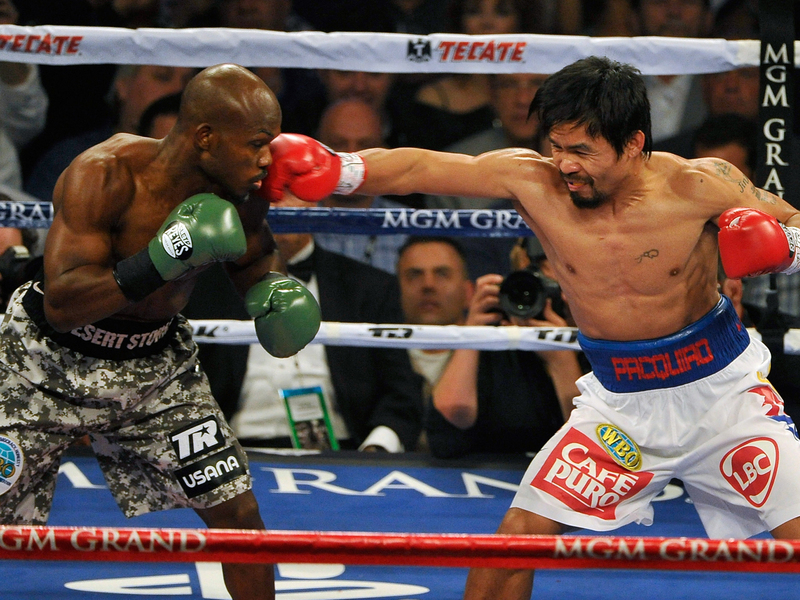 Bradley responded impressively in the fourth round, wobbling Pacquiao twice with a right hand. Bradley came on strong in the 12th, and the fighters' heads collided late in the round. Pacquiao avoided any trouble until the final bell, when he did a short dance step to his corner. While Bradley remains publicly confident he beat Pacquiao in their first bout despite fighting on two injured feet, that much-derided decision sent both fighters' careers on wild spirals. The two judges who scored the bout 115-113 for Bradley are no longer in the boxing business, but their decision ended Pacquiao's 15-fight win streak and forced Bradley to defend himself against widespread criticism of the result. Bradley endured death threats and depression before returning to the ring in unusually reckless style. He brawled with Ruslan Provodnikov in March 2013 in a sensational unanimous-decision victory that silenced critics of his style and heart. Bradley then outpointed veteran Mexican champion Juan Manuel Marquez last fall, polishing his skills and making himself attractive to Pacquiao for a rematch. Pacquiao was knocked unconscious by Marquez in the sixth round of their fourth fight in late 2012, and he took nearly a year off before returning for an unspectacular victory over Brandon Rios last fall. Pacquiao's last two performances prompted Bradley to declare Pacquiao had lost his killer instinct, noting he was unable or unwilling to stop any of his opponents since late 2009.